Now dusting is faster, easier, and more fun than you’ve ever imagined. Go Duster spins dust bunnies away in no time so you don’t waste valuable time and energy on dusting! 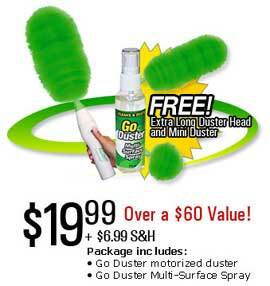 Go Duster is motorized and automatically does the work for you with just the push of a button.